With gratitude for the profound gift she has been in our lives, we sadly announce the death of our precious mother, Rosalie Blais, born in Assiniboia, Saskatchewan May 25, 1922; died at Hospice House in Kelowna, B.C. on November 7, 2018. Mom was predeceased by her loving husband, Emile Blais, who died in 1971. They were heart broken when they lost an infant in childbirth. Mom is survived by her 7 children: Alex Blais (Gaylene), Dennis Blais (Bette Lynn), Mary Ann Smithwick (Tom), Rita Thomas (Peter), Susie McCann (Neil), Alice Sales (Larry), Deanna Delyea (Garth), as well as 11 grandchildren and 11 great grandchildren. Mom had a full and meaningful life. She was born into a loving, French, Catholic family of farmers where she learned to work hard and persevere. She married her soulmate, a kind, caring and generous man who served in the Canadian Air Force training pilots. Mom and dad shared most of their years together in Assiniboia, close to mom’s family, where they owned and operated a hardware and furniture store. After dad’s tragic death, mom with the support of family courageously and successfully carried on with the operation and management of the store. In 1981, she moved to Kelowna where for 35 years she lived with Mary Ann and Tom. She was a very active member of St. Charles Garnier Parish and the Catholic Women’s League. Mom’s deepest passion was her faith in God and, of course, her family. She lived a life of service to others, had an exceptional gift of hospitality, generously reached out to those in need and spread joy, laughter and fun. She encouraged us to love fully and embrace every opportunity to celebrate the gift that we are to each other. She was known for her fabulous cooking and her beautifully designed greeting cards. Many souls have been touched by the precious little angels she so lovingly made. Many more have been touched by her prayers. Thank you, mom. Our hearts are forever filled with your love. We are extremely grateful to Dr. Rosalie Swart and Dr. Wendy Wickstrom for their amazing care. Thank you also to the wonderful staff and volunteers at the Central Okanagan Hospice House. Funeral services and a Mass of Christian Burial will be held at 10:00 am on Monday, November 12 at St Charles Garnier Church, 3645 Benvoulin Road, Kelowna, BC. Prayers will be offered at 5:30 pm on November 11 at St. Charles Garnier Church. 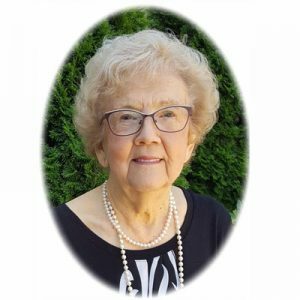 The prayer service for BLAIS, Rosalie is scheduled for 5:30 pm on November 11, 2018 at located at 3645 Benvoulin Road, Kelowna, BC. The service for BLAIS, Rosalie is scheduled for 10:00 am on Monday, November 12 . Below you will find the map for the service location and the contact information should you have any questions. Our deepest sympathy to the families. Our heartfelt sympathy to all who loved her…sending prayers and gentle thoughts. Mary Ann, Tom, Renee and family. Prayers and condolences to you all as your grieve Rosalie’s passing. She filled your home with love. I’m certain she will be missed. Much love and many hugs to the whole family! Mom and I are enjoying the fun stories of our many times together. May the good Lord pour His peace and healing balm over you, as you celebrate such an amazing woman! We are so saddened to hear of Rosalie’s passing. She was a wonderful, warm and classy person. As a little girl, I would go with my Dad to the hardware store just before Christmas and she would help us pick out a gift for my Mom. Such lovely memories of her. Our condolences, Alex and Gaylene. So sorry for your loss…. Heaven’s gain. Amazing testimonial of a life well lived!! God bless you each and every one as you heal and reminisce and realize the precious gift you’ve got to share. Next generation! Their ceiling is our floor! Keep up the great work! You are a Blessed family! Spread the wealth well! …”To know Christ and make Him known! ” covering you in prayer and Love! Xoxoxox love Kevin and Pam and family! Sorry to hear about Aunt Rosalie. She was a great lady. I remember many great times with her. Our deepest sympathy Dennis, Bette Lynn and family. We are thinking of you at this sad time and send you love and hugs. My sympathies to Rosalie’s family. My thoughts and prayers are with you all. We are so sorry to hear of the loss of your dear Mom/ grandmother. She was such a bright light in our world. Her smile and love for all shined through. Sending our love and hugs to you! Mary Ann and Tom: May love surround you, may faith sustain you, may hope encourage you day by day. Sorry to hear about the loss of your mother Mary Ann. May the belief that she is now with God bring you comfort. Our thoughts and prayers are with you and the Blais family. Sincerely, Denise and Marcel. Our thoughts and prayers are with the Blais family. Unfortunately, we never got the chance to meet your Mom/Grandmother in person. But, from the stories and such we heard, she was an Awesome Lady. I know Mason thought the world of her. So sorry to hear of your loss of a Super lady, Mother and Grandmother! Rosalie was one if a kind, a gift to family and friends!! Bessings and peace to you all!! My deepest condolences to all of you on the loss of this special woman. You are in my thoughts and prayers. Dear Alice and family I’m so sorry for your loss. I remember your Mon as a happy, caring person who always made me feel welcome throughout my youth. Your Mom was a classy lady. My thoughts and prayers will be with you through this difficult time. Alex and Gaylene we are so sorry to hear of the passing of our sister in law and your dear mother Rosalie. Although we have not seen her often during her lifetime because of distances, we will always remenber her charm and beauty.on her visit to Quebec City several years ago. Please pass our condoléances to all the members of you family. We will be thinking of you. Our thought , hugs and prayers go out to all of you! Rosalie was such a beautiful blessing to all! she will be very sadly missed but her memories will live on forever! Peace and prayers for all! Deepest condolences Alex and Gaylene and to your families. This morning I was meditating on Paul’s statement, “I have finished the race, I have kept the faith.” Certainly that is true of Rosalie. Now she has returned to her Source and can see God face-to-face, rather than through a mirror, darkly. It is a loss for us, true, but it is all gain for her. Let’s rejoice in her reunion! .To all of you and your family Alex, Dennis, Mary Ann, Rita, Susie, Alice, and Deanna, I’m so sorry for your loss..
My very best friend from the flat lands of Assiniboia, Saskatchewan to the hills and valleys of the Okanagan , B.C., We carried our friendship, The fun and laughter we shared, a round of golf, playing cards (Black Queen), fireside dinners, morning coffee in and coffee out. To name a few. Truly a very special friend..Warm, Kind & Generous. She will be sorely missed..
My deepest condolences to all of Rosalie’s family. » To share your condolence on this page please fill out the requested fields. » If you have any photos to share, please do so as families appreciate it. To share a photo, click the 'Choose File' button and select a photo from your computer. » Once you are done, click the 'Share' button. » Your email is never published or shared. Your name and email are both required. NOTE: all messages will go through an administrative process before being posted. Check this box if you want to be notified of followup condolences via email (you will receive an email for each new condolence). You can also subscribe to be notified by email when someone shares a condolence or a photo without commenting. The service of the staff at this funeral home is beyond exceptional. They certainly go an extra mile to help out. It was comforting to have David Henseleit assist us with all the arrangements. It was much easier dealing with the loss of a loved one when there is so much care and support provided. Both my parents funerals were handled by Springfield Funeral Home. Out family is thankful for how they handle people going through the loss of a loved one. Springfield Funeral Home’s family care department was very helpful to us when my Dad passed in 2013. They got us started with a pre-payment plan in anticipation for my Mom’s passing. We were very grateful for their foresight in our situation. I would highly recommend your place of business to others. David Henseleit, in my opinion, is one of the most thorough and professional people I’ve encountered in any service industry. He works tirelessly. The staff at Springfield Funeral Home treated my mother like she was their mother. There was respect and caring both for the loved one and the living. Everything was perfect from burial to service and service to reception…seamlessly done. I strongly recommend Springfield Funeral Home to family and friends. This is our family’s fourth funeral with them and each one was handled with dignity and heart-felt sympathy. Everything was perfect. Keep up the good work! The service you provide is above and beyond expectations. Thank you. I have had no other direct experience with a funeral home however, I can say, I was made to feel comfortable placing my wife in your hands. Clair was helpful and informative from the outset, including making connections to Alberta for my wife’s Interment. We were extremely please with all aspects of our experience with Springfield Funeral Home. All of the staff were extremely caring and competent. The number of things that were taken care of as part of the ‘normal’ service was much more than we expected. Thanks so much to everyone at Springfield Funeral Home! SFH looked after the arrangements for my father in 2009 and now my mother in 2018. Both experiences were excellent. Attention to detail was second to none with all of our wants and needs looked after. We appreciated the non-pressure approach taken by the staff. They took the time to walk me through the process of aftercare, after the sudden passing of my beloved aunt, in a very supportive and comforting way. © 2018 Springfield Funeral Home. All rights reserved.